If you stood outside the gates of Naval Air Station (NAS) Barbers Point 40 years ago, you would be in the midst of 1,000 acres of sugar cane. Your view to the right, up the sprawling ‘Ewa plains you would see an even greater area of pineapple. The area then was agricultural and military. NAS Barbers Point was opened in 1942 and at its peak housed 6,500 servicemen and their families, on 3,800 acres. Known as “The Crossroads of the Pacific” it was at one time the largest U.S. base of its kind in the Pacific theater. Known most famously for its submarine hunting P-3 aircraft, the base played an important role in WWII, the Korean Conflict, and the Viet Nam war. In the 90’s, however, the shuttering of military installations, known as the Base Realignment and Closure action, left Barbers Point on the chopping block of budget considerations and the installation was closed in 1999 and turned over to the State of Hawaii. The area was named Kalaeloa (“the long point” in Hawaiian). The Naval Air Museum Barbers Point was established almost immediately thereafter. Then on July 1, 1999 the State officially turned the former navy runways and hangars into a multi-use, civilian and military (the Coast Guard Station there never left), regional airport, named after the surrounding town. For its first few years, the airport was a commuter facility serving air taxis, general aviation, and hobbyists. But change was coming. The city of Kapolei, planned as the “second-city” of Oahu since the 50’s, was growing fast. Though nothing on the island is too far from anywhere else, traffic was becoming a real urban planning problem. To reduce congestion, and ease some of the strain of Honolulu, Kapolei was envisioned as a self-contained place with housing, business, and as a secondary consideration (at the time) an airport, and with being the terminus for a light rail system that is well under way today. 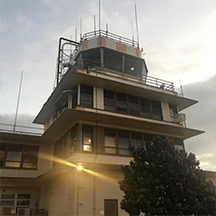 In 2014, Mokulele Airlines began flying commercial passenger flights out of Kalaeloa, cementing the proposition that aviation is an important and viable part of the community. With the population of the surrounding cities expected to triple by 2020, and with the new rail bringing passengers close to the airport, growth and expansion seem inevitable.